Musicians Lifeline, Inc. is proud to announce a major event! 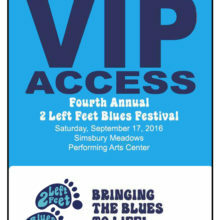 The 2 Left Feet Blues Festival was started several years ago by two true advocates of the blues as a way to engage with other like-minded individuals who shared their passions. As they got to know the musicians on a personal level they realized how little support—financially and physically—there was for them after a lifetime of performing. 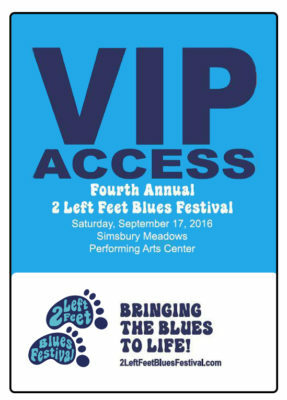 They vowed to turn 2 Left Feet into a nonprofit organization in an effort to raise funds to help aging musicians with the ever-increasing costs of health care and support. We also support and educate surrounding communities in the proliferation of Blues music and history. We accept PayPal, Debit Cards and Credit Cards at checkout. After you click or tap the "Donate" button, you will be taken to a secure checkout form for your donation and billing information. Musicians Lifeline, Inc. is a volunteer organization that responds primarily to the medical and social needs of regional musicians and music professionals in our community. The mission of Musicians Lifeline is to support and provide charitable assistance to all types of music industry professionals located in the greater New England region who are struggling to maintain their livelihood, due to illness, disability, age, or unemployment. Money raised through benefit ticket sales, donations and sponsorships are used to pay for medical expenses, prescriptions, insurance premiums, housing, food, utilities and fees for services and counseling. We are also dedicated to educating the public about the importance of musicians in the community and the financial hardships which can negatively impact a music professional. If you know of a musician who may need assistance, please tell them or a family member about Musicians Lifeline, Inc. Musicians Lifeline, Inc. provides financial assistance to career musicians from every musical genre. Grant recipients include career musicians (club and session musicians, recording artists), arrangers, composers and songwriters from the New England region. Music professionals who apply for assistance must demonstrate financial hardship with accompanying documentation. Even if a grant recipient has private or publicly funded health care, they often require assistance with other necessities. Financial grants are paid directly to medical providers, hospitals and authorized entities such as insurance companies or utility companies. The Officers and Directors of Musicians Lifeline, Inc. receive no compensation for their Board activities. In addition, the Officers, Directors and their families cannot receive benefits from Musicians Lifeline, Inc.